Toyota Vehicle News. Only The Auto Channel provides complete industry coverage by make. 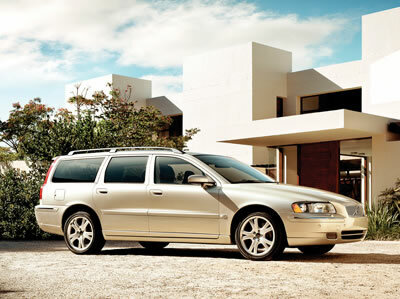 The safest wagon ever built by Volvo, the V70 benefits from a comprehensive array of safety features. Included are the standard Side Impact Protection System (SIPS) with side airbags and Inflatable Curtain (IC), Whiplash Protection Seating System (WHIPS), seat belts with pyrotechnic pretensioners in all seating positions, dual-stage front airbags (SRS), Volvo’s safety cage construction and the ISO-FIX attachment for rearward-facing child safety seats. The V70 is powered by Volvo’s five-cylinder, in-line, double overhead cam transversely mounted engine. Under the hood of the V70 2.4 is a normally aspirated version that puts out 168 horsepower and generates 166 lb.-ft. of torque coupled to the standard 5-speed manual transmission or available 5-speed microprocessor-controlled automatic. Selecting the V70 2.5T nets the turbocharged, intercooled edition that spins out 208 horsepower and 236 lb.-ft. of torque. This powerplant is mated to a standard 5-speed Geartronic automatic transmission. It enables the driver to shift manually when desired via the Auto-Stick function.